Available in 2kg, 4kg, 6kg, 8kg, 10kg & 12kg weights and tailored mixed weight sets. Ergonomically designed kettlebell with comfort handle for better grip and handling. Colour coded design with wipe clean vinyl outer and anti-slip base. Designed for whole-body, functional training. Develop co-ordination flexibility and build solid core strength. The JLL Kettlebell range is perfect for cardio and strength training. Lose weight and build great muscle definition and have great fun all at the same time and do it in the comfort and privacy of your own home. JLL Kettlebells are built to the highest standards. Hard-wearing vinyl coating complimented by an anti-slip base. This provides extra safety and also protects the floor from scratch damage. The JLL Kettlebell comes in a variety of individual weights 2kg, 4kg, 6kg, 8kg, 10kg & 12kg variations. Or if you’re feeling more adventurous, why not try our tailored kettlebell sets? A mix and match of our more popular weight combinations at prices that won’t break the bank. 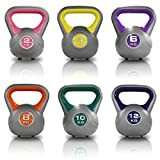 Our kettlebells work a broad range of muscle groups including the biceps, triceps, deltoids, trapezius, latissimus dorsi, quads, glutes, calves, hamstrings and core abdominals.